Subject- Deficiency in providing of services by banks to sick pensioners/family Pensioner. It has been observed that number of grievances are being received in CPAO regarding deficiency in services rendered by banks to pensioners/family pensioners. Pensioners/ family pensioners especially those who are sick, paralyzed and bedridden are facing problems while withdrawing their money from their respective pensions accounts. 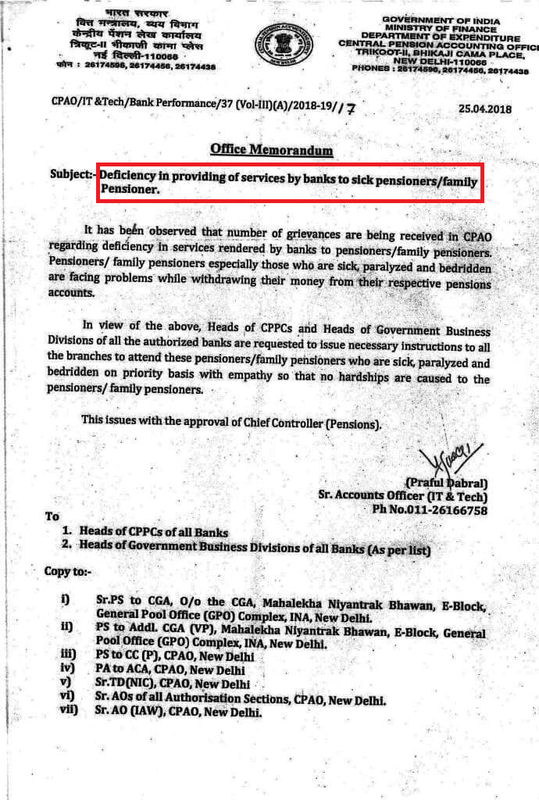 In view of the above, Heads of CPPCs and Heads of Government Business Divisions of all the authorized banks are requested to issue necessary instructions to all the branches to attend these pensioners/family pensioners who are sick, paralyzed and bedridden on priority basis with empathy so that no hardships are caused to the pensioners/ family pensioners. Banks are instructed to attend all these pensioners/family pensioners who are sick, paralyzed and bedridden on priority basis with empathy so that no hardships are caused to the pensioners/ family pensioners.